Two Strokes: Most older mopeds and motorized bicycles are two stroke engines that do not have motor oil in the crankcase. 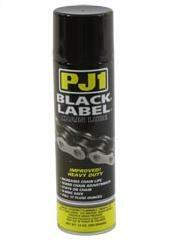 Instead the crankcase has a mist of gasoline with 2% or 4% two stroke oil blended in. The crankshaft and piston are lubricated by the gasoline mix. Two stroke oil is designed to be stable when mixed in gasoline, and to burn clean and not make black tar and carbon build up. 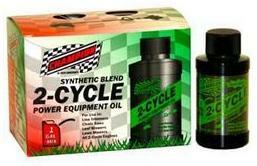 Regular motor oil will work in a two stroke, but will leave a mess of tar in the engine and or gas tank. 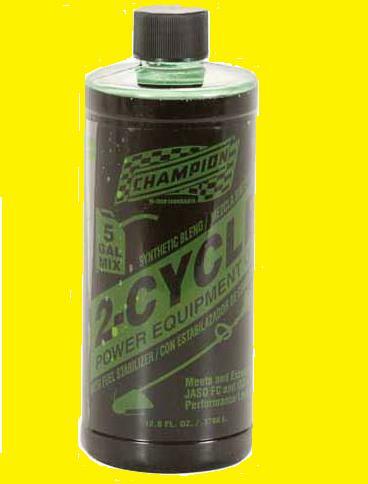 In the “old days”, the two stroke engines did use ordinary motor oil. But they had to use it or it would become tarry or varnishy from decomposition. 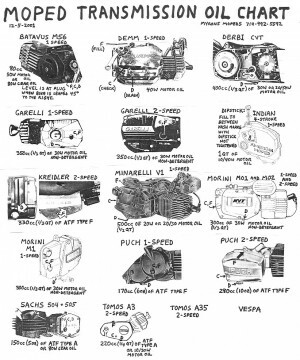 They also “de-coked” their two stroke engines often. 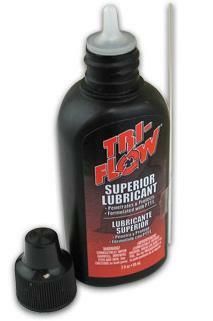 This practice has been completely eliminated by modern two stroke oils such as Champion. 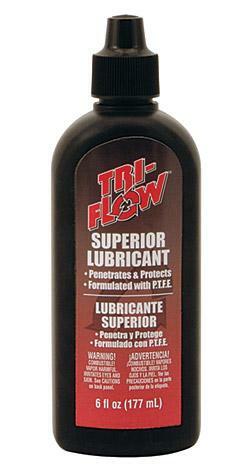 Transmission Oil Specified in Owners Manual: Often the specified oil is obsolete. In ATF, the old “Type A” (non-Ford) went on to become Dextron (Type B) in the late 1970’s, and then Dextron II (Type C and Type D), III, IV, V, and now “Dextron VI“, for most GM vehicles and pre-2004 Toyota automatic transmissions. 1970’s Tomos and Sachs mopeds specified ATF Type A. Tomos also specified motor oil 10W30. The old ATF “Type F” (Ford/Mercury) went on to become Mercon in 1987, as did “Type G” (Ford Europe), and then Mercon II,III,IV, and now “Mercon V“, for most Ford, Lincoln, Mercury automatic transmissions. 1970’s Puch and Kreidler mopeds specified ATF type F.
Type A versus Type F: Type A up till the 1970’s contained whale oil as a friction modifier. A modern friction modifier/reducer is glycerol mono-oleate. Type F contains no friction modifiers, but has a higher quality base. Modern vehicles have nine current ATF versions: ATF+4, Mercon V, Mercon LV, Dextron VI, ATF DW-1, SP-III, Matic-S, Toyota ATF-WS, Honda DW (ZF). Any of these will work in a moped transmission. They are only slightly different. ATF Mercon V would be the safest to use, since it does not have friction modifiers. Friction modifiers are better for the gears and bearings, to reduce friction and extend life, because part of the molecule clings to metal and part is a long chain that slides over metal easily. What’s good for the metal parts may or may not be good for the clutch. This is a current area of investigation. You are currently browsing the archives for the Oils & Sprays category.